I couldn't resist it, sitting there shouting at me to buy it. 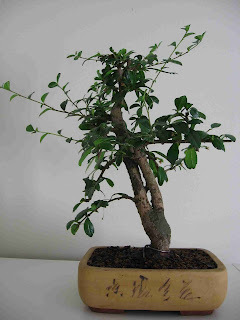 That is this Fukien tea tree (Carmona microphylla). I saw this on a visit to Ikea here in Raisio, Finland and after the recent loss of my Fukien tea tree I had to buy it to see if I can keep this one a live. It has a split trunk which is already quite thick at the base. 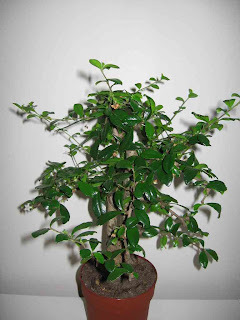 Everybody has to have at least one Fukien tea tree in their collection as they are a very common indoor tree that can be purchased from many garden centres or large supermarkets. My son Alex with the same tree. 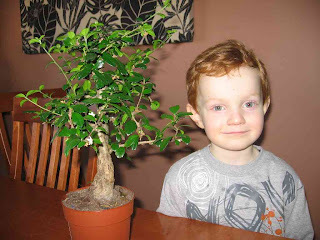 Hopefully another budding Bonsai enthusiast in the making. As usual with Malsai trees purchased from this type of shop there are some clear areas that needed immediate attention. 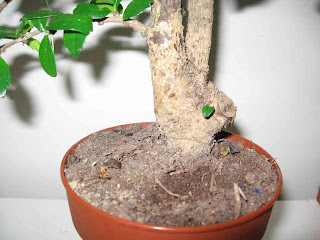 This tree came in a standard plastic pot, not in a bonsai pot for some reason, so that was the first task to get the tree into a pot, or at least try depending on the root structure. The other areas that needed immediate attention were the cuts on the side and top of the tree. I believe this type of untreated cut was one of the reasons why I recently lost one of these trees. I chose a light brown unglazed rectangular bonsai pot with a motif for this tree. 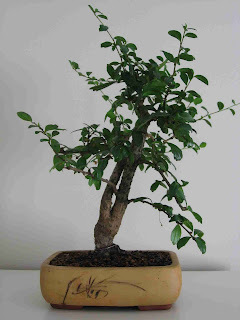 The rounded edges of the pot gives a slightly feminine feel that goes well with this tree that normally shows masculine features in its trunk, but has a feminine side with small white flowers appearing if water is restricted for a short period. The size of the pot is 19cm and the height of the tree 29cm, matching the 2/3 'rule' for pot to tree ratio. The depth of the pot is 4cm, almost matching the truck diameter of 3.5cm, and was perfect to fit all the roots without having to do any cutting. 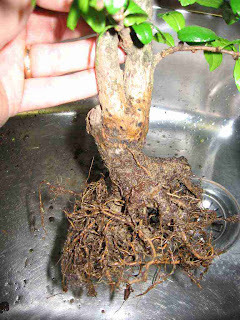 There are two larger roots that now are shown as nebari (surface roots flaring from the base of a tree) but more work is needed for the other areas. The lack of bigger roots also meant that I had to wire the tree into the pot using the base of the trunk. I will need to keep an eye on this and may need to repot again next year and try to position the wire away from the trunk. The tree will now be given time to settle in and I will allow the top to grow unrestricted for a while before starting work on shaping the branches. You may just make out the grey area in the above photo. This is the same area in the earlier photo showing the cut. I completely removed the cut and shape the trunk to follow the rest of the surrounding area. 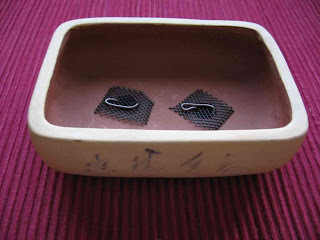 The grey colour is cut paste applied to help with the healing process. As you can see it now as a slight slant. This was mainly because the tree sat this way better in the pot. It definitely added something to the final outcome than just having the trunks positioned upright. I need to take some better photos when it is warm enough to take the trees outside for some natural light.